Wild Rummy is a card game where players try to gain points by collecting cards and categorizing them into groups before laying them down to earn their points. When the first player runs out of cards, all players will add up their points and the players that still have cards remaining in hand must deduct points based on the cards they are still holding. Select a card, or cards, to be the “Wild” card. When played, a wild card can be any card the players desire. Deal 13 cards to each player. You must have at least two players and can have as many additional players as you desire. If you have more than four players, you will need more than one deck of cards. You will need cards left over to have in the center of the group available for players to pick up. Sort your cards by suit and then by pairs. You will need at least four cards of the same rank or in sequence before you may lay them down. For example, you can lay down four aces or numbered cards of the same suit such as a 4 of diamonds, 5 of diamonds, 6 of diamonds and 7 of diamonds. Flip one card over from the stack of remaining cards in the center of the group. On each players' turn, they must pick up a card from the deck or the disposal pile with the face up card. If you do not desire a card, you may lay it down in the disposal pile. If you want a card that is in the disposal pile that is covered by other disposed cards you can take it, but you must also take all of the cards that were laid down on top of it. You may only dispose of one card per turn. Lay your cards down when it is your turn and you have matched cards by pairs or by sequence. You may also lay cards down that coincide with other players piles. End the game when a player runs out of cards or the pickup pile and disposal pile are both empty. Add up each player’s points. 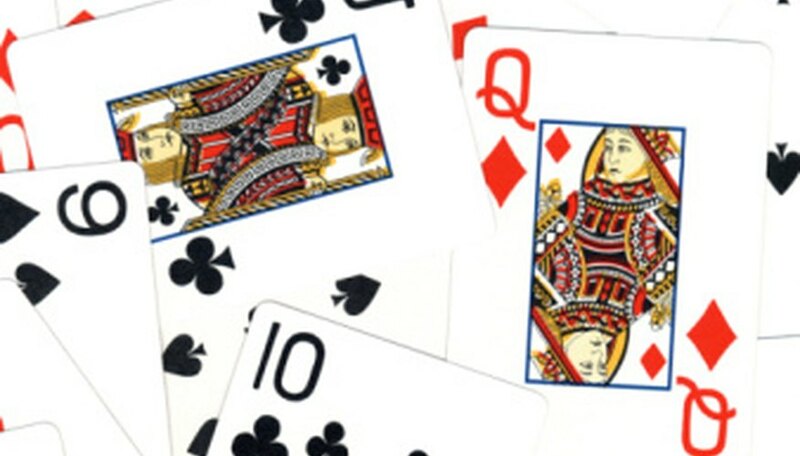 Aces are worth 15 points unless they are being used as a 1, kings, queens and jacks are worth 10 points and all numbered cards are worth their number. Deduct points for each player who had cards remaining in their hands when the game ended. The player with the most points wins.